Topic: The Grizzly's Xenos, Mechs and Pointy ears ! The Grizzly's Xenos, Mechs and Pointy ears ! Well hello everyone. I guess that if you read the tittle you have a good idea of what's going to be seen in this topic. Yep exactly I am starting a project log... it's kinda like a learning topic for me as I do not have the pretention to be a good painter so that's not what this topic is meant for. Therefore please give me you guidance. I plan to paint everything before i buy anythign new i can't stand anymore to have an amry where half is painted and not in the good color on the table. yeah i did that once or twice already and now it's stop! So without further delay let's get a look at the grizzly's army in his cave. ... yeah it's pittyfull i know. 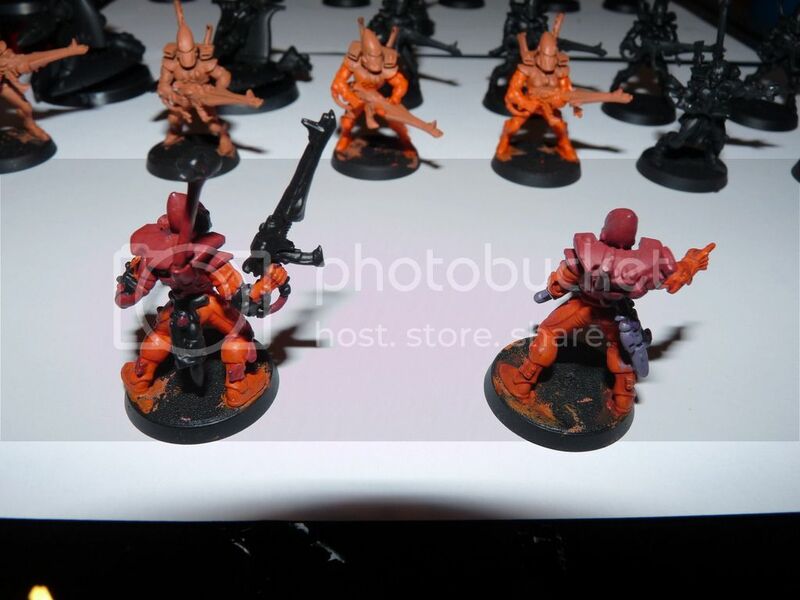 Then you have the only two guardian that are painted ... the left one is how i'm gonna paint them from now on and the right one is how i was gonna paint them until I started to paint the Autarch. It was lacking in impact so i took the daemonette hide out for black, on the weapon, i'm leaving it on the helmet. 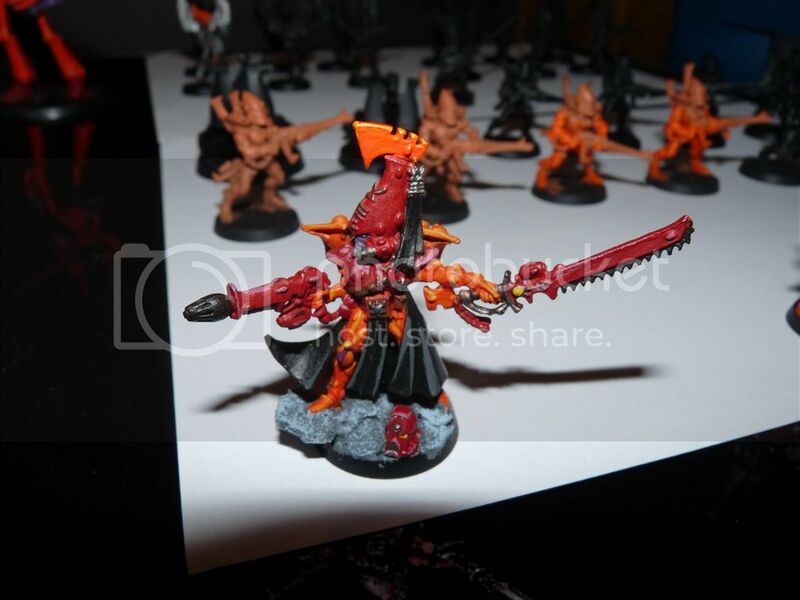 Their you have a pick of the wraithlord it's pretty old model and the weapon aren't in the good color either yet but it should be change soon enought. The idea behind this project is to motivate me in painting my minis, if I have a weekly update to do i think i will be more motivated to paint those guy's. There are some problems with your pictures. When using photobucket, if you want to link the images in a post, click on the image from your album. There should be a list of URL's in a box on the right side, if you click on Direct Link it will copy the url automatically. Then you just need to put that link in between the IMG tags on the forum and it will properly display the images for you. I tried to edit them, but the links you have don't link to the picture themselves. How to post Pictures within this section. ye, your picture links aren't perfect. Having said that, I could somehow find the pictures anyway! I see you have a few vehicles that look like mine... I'd almost find it a pity that you'll be painting them over! haha, just kidding, it would be great to see your army in your colors. I think the two guardians and the wraithlords would be fine, if you base them. 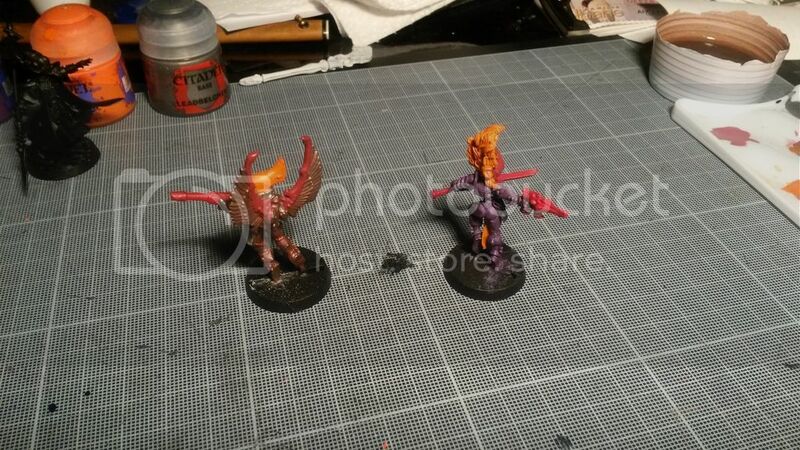 Basing your minis makes a huge difference, and your autarch shows it! check out my Iyanden painting blog. @Tangi : ty for the tips regarding the direct link this where i had made a mistake. @Irisado : as stated above my mistake was the direct link. Otherwise I followed the method in your second link that's why i was not understanding where was my mistake. Because of lack of time and laziness reason I will had the url link later on. Ty anyway. If anyone got anything to say go ahead I'm opened to all criticism. By no means did I mean you should keep them in the iyanden scheme - a cohesive scheme across an army is far more impressive than one or two well-painted models. Also, I'm personally always proud to say I've painted an army, not that I got it painted from e-bay. 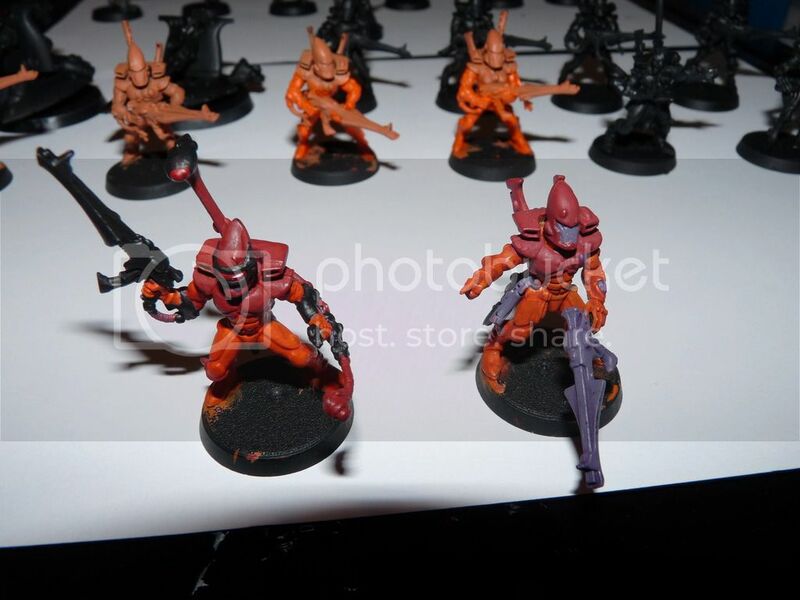 I wasn't sure at first, but now with the pics being a bit easier to see all in line, I agree with you that the purple on the weapons isn't doing them much good. 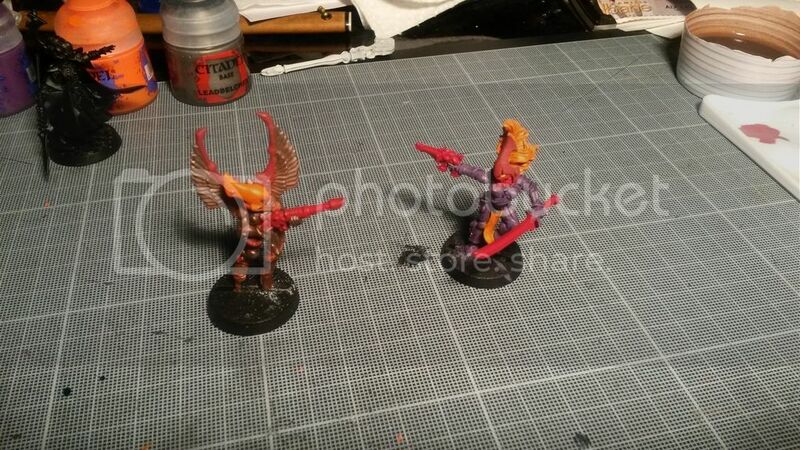 The color balance on your autarch looks much, much better. Keep up the good work! Well they look nice. You have that certain Eldar trait working for you in the colors. I will suggest to add some black or white on the guns maybe on the rib to break up the purple a bit. Keep 'em coming! Nice! I like your color choices really unique. My advice on taking these guys up to the next level would be to try some washes to get some nice shading effects going. Also a bright accent color for the eyes/gems would be great too. I think a bright yellow would like nice for the gems and eyes and a simple nuln oil wash applied lightly around the gems and grooved elements of the armor would give these guys depth. Thanks for sharing Grizz looking forward to following this! Ty about that ^^ i tried my best to get something eldarish going, the orange came from yme-lock color theme but i switch it's place with the grzy and changed the grey for dark red. As I said in the guardian text, the purple is going to disappear in the color theme, exept for the helmet part, and be replaced by black. It should really give some more punch to the over all army. The only moment i'm gonna use it now is for all the bone like things. I mean things like runik armor on seer, banshee's armor, well you get the idea. Regarding the wash, i did one... but with a blaze color so it's not working much. It does give a nice color to the orange but no shadow. Should i use the nul'oil solo or with the earlier said blaze, in a mix to keep the shadow red like. If not, do I need to diluted the nul'oil or straight on it's fine? Should i use some on the autarch and the black aswell? I don't think it would show on the black. Just straight Nuln-Oil will do. 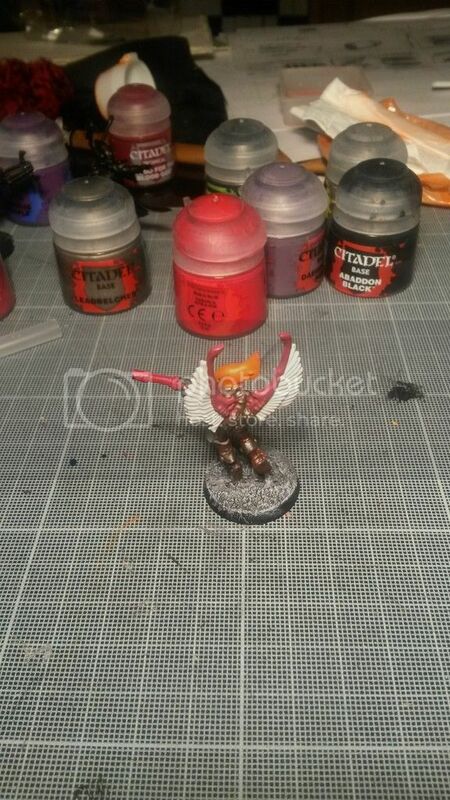 Agrax Earthshade is also an option if you want a more a more blended shading effect on the orange but straight Nuln-Oil was give you some crisp shading an enhance the lines of the model. 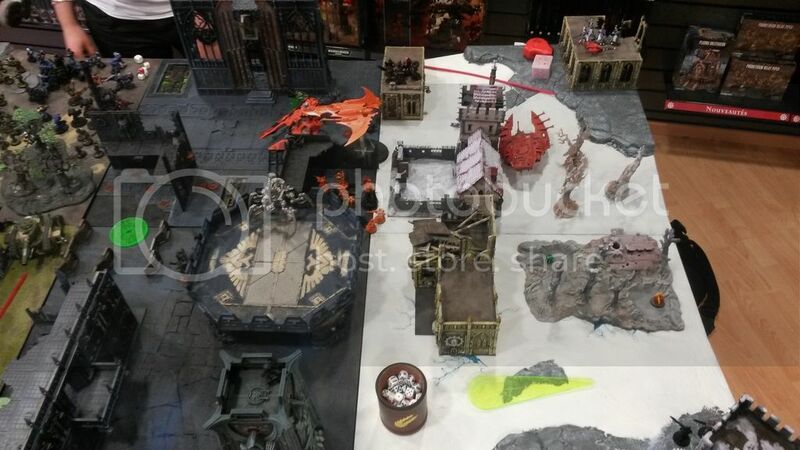 Well hello everyone ... i was hoping to get some battle report in today... but while writing it i noticed that there was few mistake done during the game so I'm just posting the photo of it. basicly it was a 1285 + 350 ally games in a 2v2 set up. we played eldar 1285 (me) + necron 350 points (my buddy Traqueurs Stellaires) VS dark angel 1285 (a kid that played his first game with marines) + eldars 350 points ( with 3 players that played one after the other). 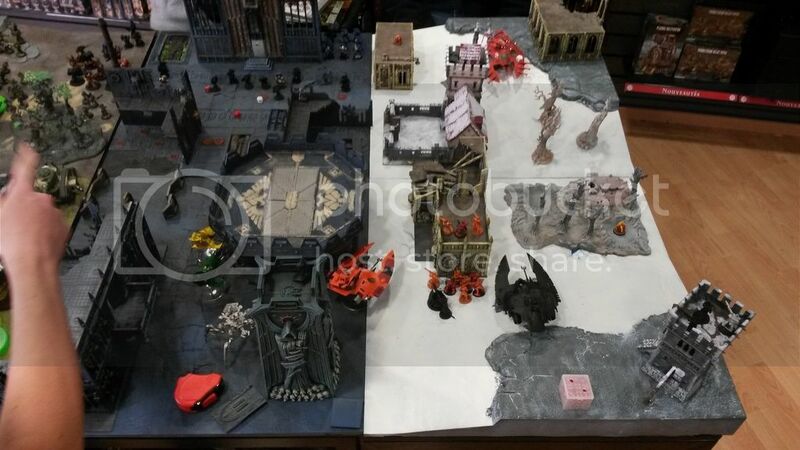 this is just after the marines turn 5, all the ennemy eldar are dead at this point, only azrael is alive in the marines and the termy are still in reserve they missed there deepstrike and rolled 5 so back to reserve. The game ended with our side tabling the other and with the termi still in reserve. Well the other troublesome things is that ater turn 3 my oppponents got bored so he was not playing much anymore, some other guy's took his place. 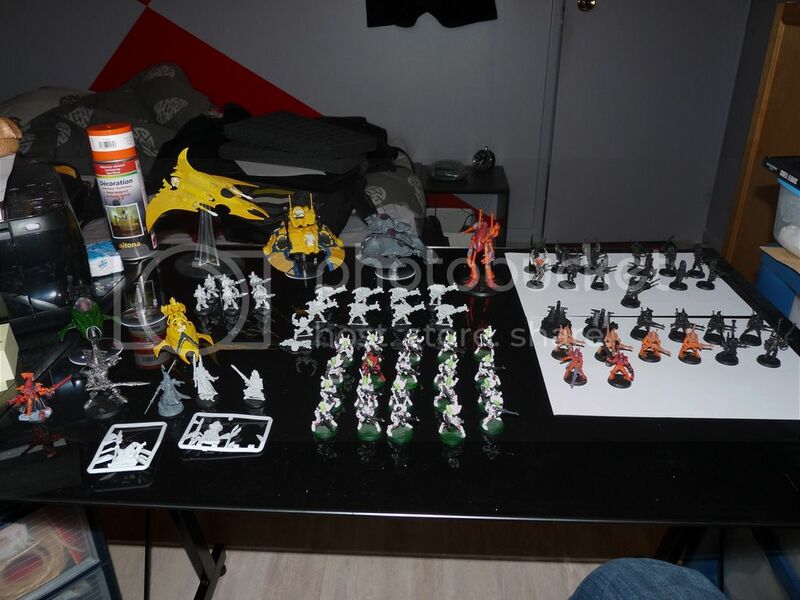 To his defence he was a kid and at the end of turn 3 he add lost half his army when we barely had lost one vyper, and the fire prism and 1 guardian so i can understand why he god so disheartened. Some unit that created a place in my hearth for them: Vyper they were beast and i like the way they can move around fast to get in a good position to fire and still be placed nice for cover (even if i did not use much cover this game). Next is crimson hunter exarch, on the turn it came in i fired everyhting at the serpent, wich had only one hull point left and had shield up, i needed to take him out and i roll 3 2's to hit... i was so glad i had payed for the exarch upgrade, I will never ever take a non-exarch hunter unless i field more than one. And the falcon was beast this game too SO i'm defenetly having again in my game to come (should work pretty nice with the upcoming dex judging from the rumors). Other unti that should see a lot of play are the reapers, they did a wonder in this game, i payed for the starshot missile but never had to use them, so that's a drow back but i will surely need them at some point so i'm gonna keep paying for them. They were beast to take out the marine but more importantly the bikes, preventing them from having jinx save was really good. So I'm keeping them in aswell. Spyder where pretty underwhelming, they sure can move but they did little dammage and got destroyed in a CC that was some lucky role on the enemy side and bad luck on mine but still they disapointed me by quite a lot i have to say. Will need to see in the new dex but judging from the fact i have a lot of them i will probably keep playing them for a while. and I don't think my target priority with those was good either. I have a lot of room for improvements. In every field that's for sure, can't do much with the mistake this game, so once i get some games without mistake in, I will be sure to tell you everythign so that you can help me improve if you don't mind to do so of course. For the other things that are coming up there is, a guardian squad, actually getting painted, the farseer (one day maybe) and the aspect warrior, as I am currently in the process of creating the color scheme, banshee are nearly finished and same goes for the hawk. 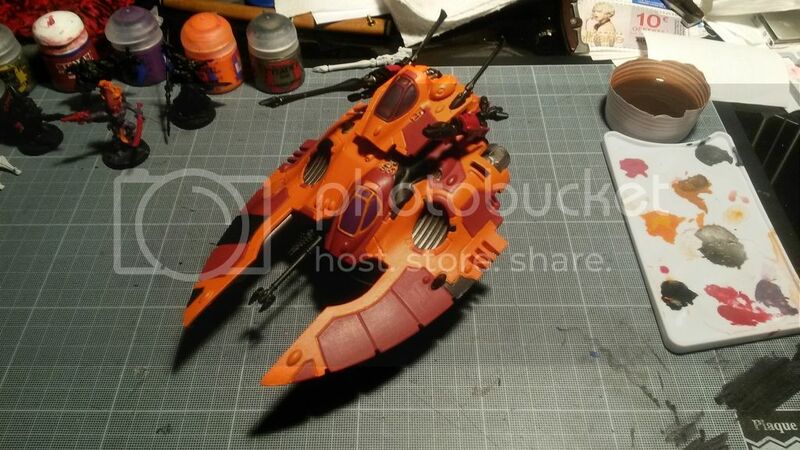 I'm curently thinking about the spyder and the dark reaper but I think I found So you will see this soon (hopefully). And should follow the nightwing painted (reminder i use it as a crimson hunter). please forgive me for the bad pictures quality. Awesome stuff Grizz. Sounds like you guys were having a great time so don't worry about mistakes. I don't think i've played a game where there were not a few mistakes on both sides. Sounds like you had a very cool mix of units which is nice to see. When you combine all the different elements of the army you don't really need to spam all the power units, theres a tool for every situation. Also looks like you've done a lot of work on your army. Everything is basically the same color which is cool. Keep up the great work and thanks for sharing! Well for the color it's mostly thanks to an orange spray i had but ty for this cavalier. It's always appreciated. 1 autarch fusion gun, mandiblaster, warp jump generator, scorpion chainsword. 1 unit of 2 vyper starcanon/shurican for each. 1 unit of 7 spyder with one being an exarch with no upgrade. 1 crimson hunter exarch with bright lance (i defenetly Love that unit will field more than one some day i think it's really strong). 1 falcon with pulse lazer starcannon and holofield. 1 fire prism with holofield. Hey there yeah new post, i took out the previous one because it was not really suited to be here and put it in the battle report section. So i bring some painting today everything is still work in progress but enjoy the small update. First we go, Falcooooooooooooon Punch!! ... ... no ? ok well never again then. The spirit stone are to be done on this one but out of this nearly everything is done maybe the lower canopy need some repaint. the said canopy is fully painted btw because it was already painted when i bought it and I had to paint over it to keep the global feeling of my tank. And there some aspect, the swooping hawk need some color change, i'm thinking about putting the wing in white. that should make for a more lively model. The sword need to be repainted on the banshee. Détails and highlight need to be done on both. and maybe a clearer paint on the armor plate for the banshee. Remember that these are all WIP and experiment. Some guide line i set myself for the aspect. to keep an sens of unity in the whole army, i will always have some orange on the helmet of the aspect. 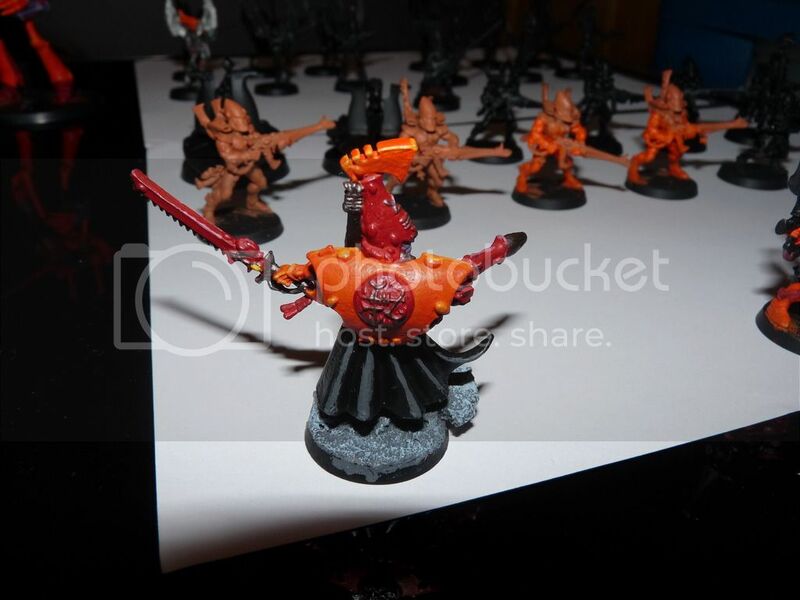 To make the weapon from the aspect stand out a bit they will all, no mater the aspect be painted with base color of Mephiston red. Those are my personnal limitation on those for the colors. Next time I should bring you these aspect finished, and the other aspect, or my farseer, and the finished falcon. But i don't know when that will be as i should be quite busy for some time. That is some smooth looking orange on that falcon. Well painted! 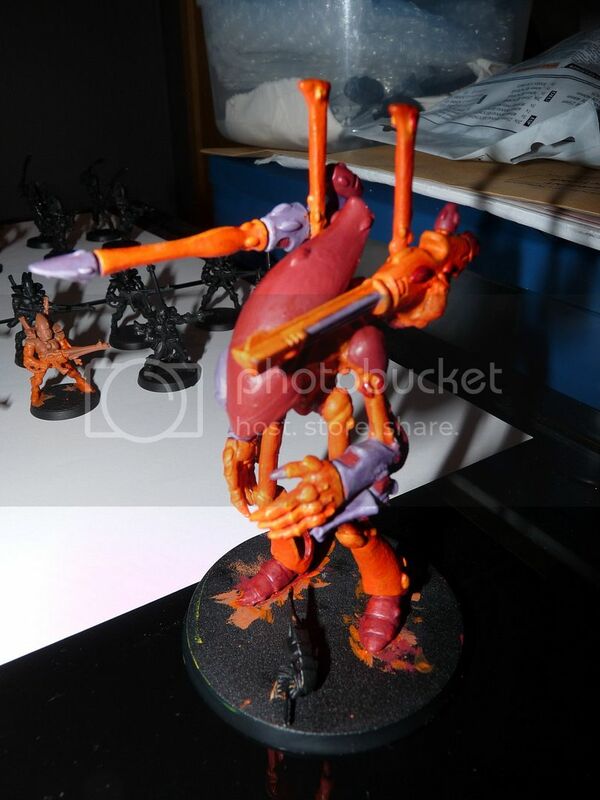 I also like the balance of colors on the model. Enough of everything to balance out every part of the model. I also really like your ideas to tie all the aspects together - that should keep a cohesive army. 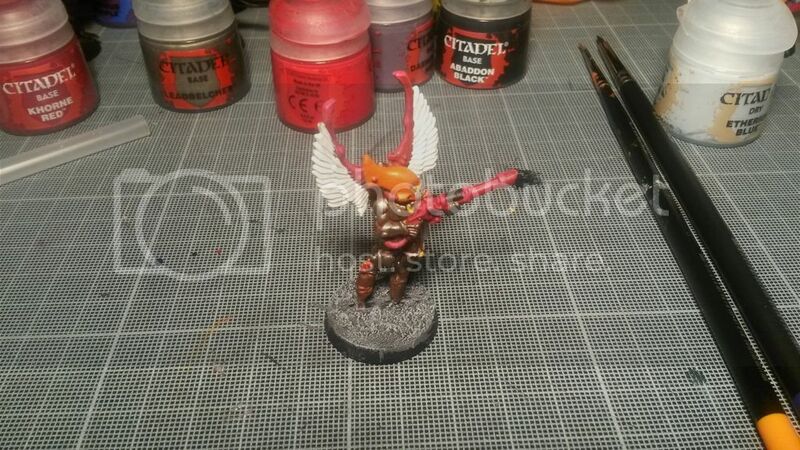 Also, I'd say go for the white on the wings! yes, the white wings work perfectly! Looking good Grizz! 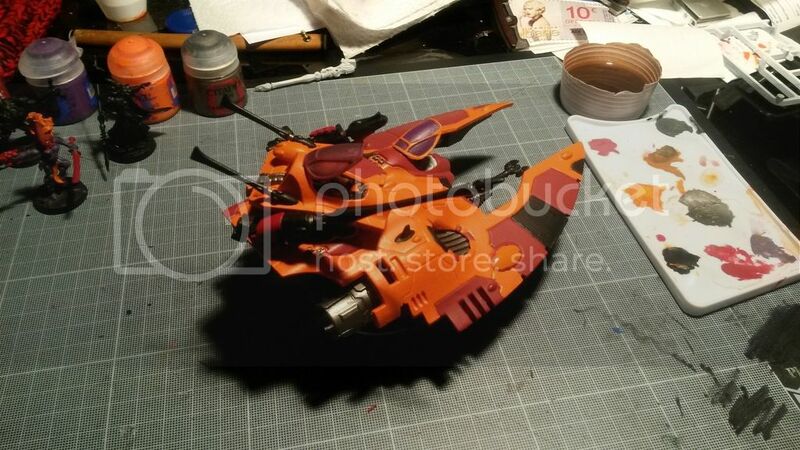 You know your paint scheme really reminds me of the scheme used on the cover of the 2nd Edition Guardian boxed set... which is very similar to Forge World's scheme for their Corsairs. 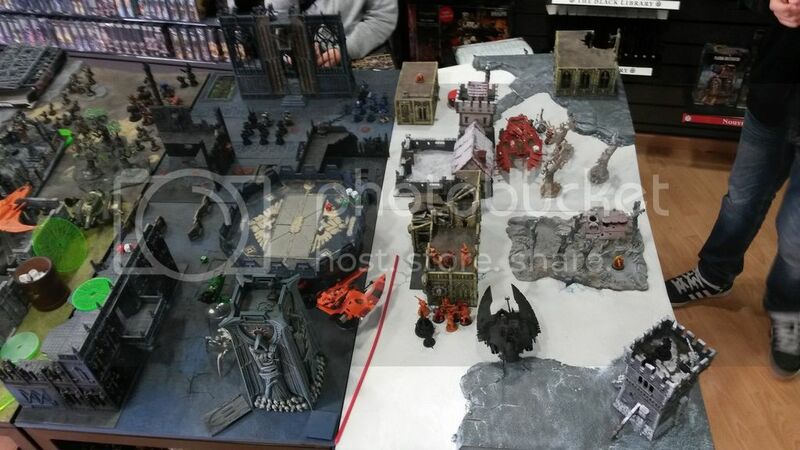 BTW what Craftworld do you play? Is it one of your own making or is it Lugganath? Well that is a pretty intresting quesiton there cavalier it's true I didn't took the time to devellop the fluff part of my army. Well then let us get into it. My craftworld is a personnal and original craftworld. I rescently watched an Anime called Aldnoah.Zero, a step away from the master piece if you ask me. And there is a sentence in there that catch my ears and heart. " Let justice be done throught the heaven's fall. " I kept the heaven fall part and translated the name into Tel'Quessir, I don't really know what it is but well. I like the sound of heaven in Tel'Quessir, wich is Arvandor. So there you go this is my Craftworld Names, Arvandor, the Justice of heaven. that sound a bit pumporous like this now that i think aobut it. On things I wanted to do when i started to play was to be able to say Make it Rain, like rain of bullet i mean. 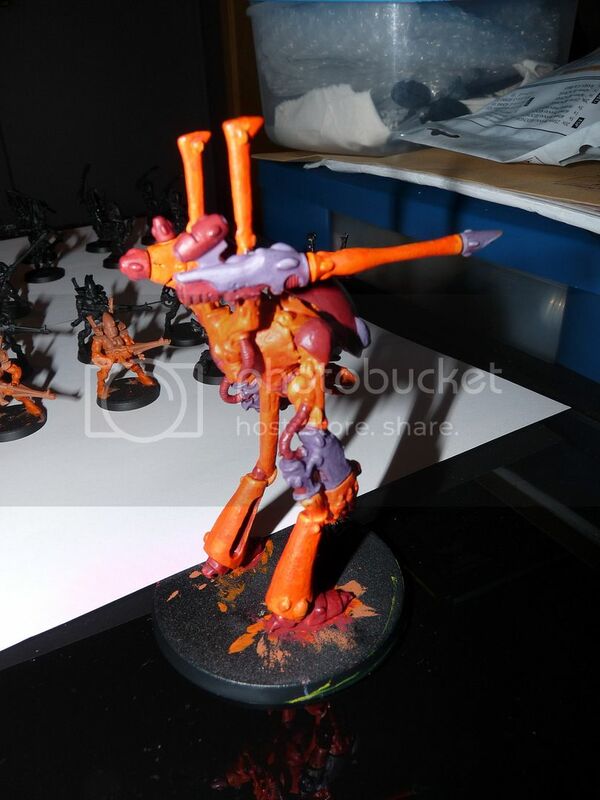 So that's going to be my guide line for this craftworld. I have a few guide line i would like to use from the list choice perspective. I will go into them as we go through my Craftworld story. From a geographic point of view, if i may say, My craftworld is lockated somewhere in between Baal and Honorum , not too far from the Perdian Gap. They are often facing against Blood angels and Chaos spacemarine, because they are right in between those two. If I were to discribe my eldars, I would say they are a bunch of eldar that learned to fight and to use every resources at there disposal to stay alive. Faced with immense foes, such as Blood angles and Chaos army, pretty often they understood that they did not stand a chance when it came to fight in CC compared to bring down you foes before he reaches you. They develloped the Alpha strike and repositioning tactics, and learned to exploit them in every type of battlefield, be it human city or waste land of deserted world. That why the Dark reapers and Vyper are often core to the army. They can fire the opponnent before it get to close and in vyper case reposition on the other side of the fight if need be. When faced with unbelivable threath, the Avatar in the craftworld is woken up and send to fight with the banshee, if you can't gun them down, you just have to face them head on in a fight, after all you are not going to let them kill you just because they reached you. There is also one things they came to understand. Air support Can be key. Their Autarch, the untouchable Ereden Ohta, is one of the Few autarch to have walked the path of the Crimson Hunter. As long as he is fielded, the Army must field at least one Flyers. Yet even if he walked the path of the crimson hunter, Ereden did not stop there and found himself with the warp spyder. He stayed very close to the temple he visited. Therefore if fielded, Ereden must join with a unit of warp Spyder. There is one things to know, Ereden did not choose the Path of command, he was made into following it. Most eldar chose a path to keep there mind from wandering. But Ereden did not. He could not follow the righteous path of the eldar, and left the craftworld as an outcast, becoming a ranger. He saw countless battlefield and discovered contless beauty in the star. But one day he got take in by khaine grip. He had been touched by Khaine. As Khaine grip was getting tighter he nearly killed one of the member of his ranger crew. To save his friends and himmself he went back to the craftworld. When he arrived, on the dock was a farseer. Sulrista Arrno was a young farseer at the time he had just started walking on the path of the seer and still had some training to do. But as he was letting his mind wander in the infinity of space he had percieved the pain of Ereden's mind. While the ranger was traveling back from space the young farseer explored the future and while he was looking find that if Ereden followed the path of the Command he would be able to save an important number of craftworlder in an upcoming war (we are speaking about a few century away in the future there), rahter tahn taking the risk of letting this future disapear the young farseer chose to go and talk to the ranger, nearly getting himself killed in the process. The ranger's burst of anger at the eldar that was pretending to be able to tell him what to do, when he had chosen to leave the craftworld, nearly sent the said eldar straigh in space. Well in the end it did not happened by some kind of fortunately transport passing by, or was it really fortunately? Once calmed down Ereden listen to what Sulrista had to say and followed him to a warp spyder shrine. Left at the door with all his things and nowhere to go he had no choice but to step in. Here began his commander path. As predicted buy the young seer, soon after ascending to the autarch position, with the help of Sulrista, that had become a full fledged seer during that time, he defeated a space marine army that would have destroyed a enormous part of the craftwolrd if left untouched. There had begun the Jumping storming duo of Ederen Ohta and Sulrista Arrno. And that should be ok for some background. I will had some more later on as things come in what do you guy's think? I'm no good with story righting/ story telling, so forgive me on this.